"Lisa, this guy is a genius!" Sheila was talking about Jack Brainard. She had met him through the Light Hands clinic, had picked up his book, "If I were to train a horse," read it and re-read it, voraciously studying every word and practicing his maneuvers. She was a perpetual student her entire life. A year later, there we were, in her arena, with Jack himself, practicing shoulder in, shoulder out, placing each foot precisely. "Nuno Oliveira was the best horseman in the world that I know of!" Jack said, with enthusiasm. Boy, I thought, that's pretty high praise. "Nuno is no longer alive, but he rode a horse, communicated with a horse, better than anyone… EVER!" Jack doesn't' hand out compliments freely. I thought, "who was this guy?" Master Nuno Oliveria was a classical dressage trainer in Portugal that died in 1989. He supported that teaching and practicing riding should be based on lightness, freedom, beauty and harmony. He is quoted, "The horseman who constantly holds his horse with a strong touch can never improve; only the horseman who knows how to work his horse free, will discover the art of riding." I also found out that Tomaz Alarcao, a student of his, had bought Nuno's farm and was well respected himself in the world of dressage, having students come from all over the world to study with him in Nuno's beautiful arena. We found our way to Malveira, Portugal in a downpour. 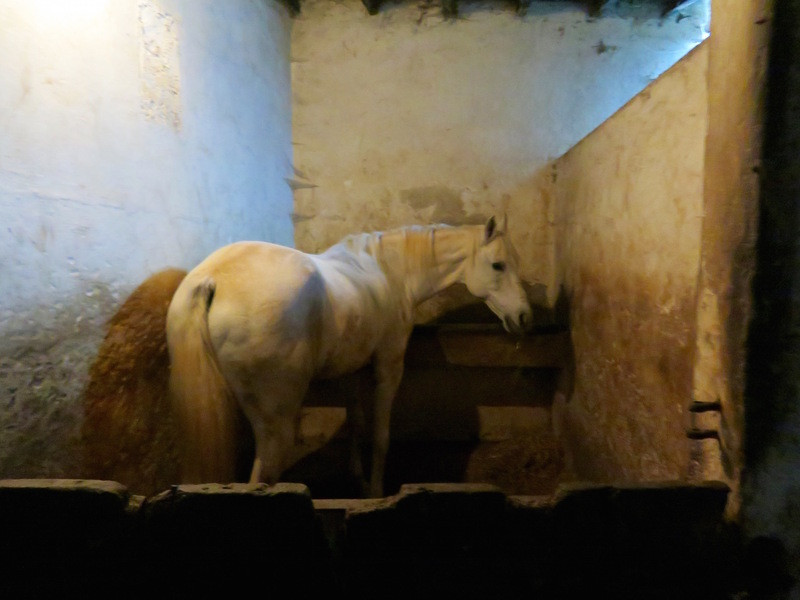 We'd had two days to adjust our internal clocks in Lisbon and were now headed to Nuno's old farm, to ride with Tomaz. When we finally found our way to his gate (Siri could get us only so close, the last few miles were a challenge), a tall, thin, very dark man with a huge smile named Amado picked up both our heavy bags and trotted up the hill in the heavy rain to our apartment. "Do you speak English?" I said. "No" he replied. "Espanol?" He shook his head again, "no, France." "Oh… um, obrigada!" I said (Portuguese for thank you.) He shook the rain from his jacket, built a fire in our little living room, and then left us alone to settle in. Tomaz and his wife Antonia came to our door a couple hours later to introduce themselves. They came in with open arms, like we were long lost family. Inside I felt like a five year old on Christmas morning bursting with joy. Now, I have to fill you in here. I have never ridden dressage, (only that little bit that Jack Brainard had worked into his program and a smidgen of Cowboy dressage). I have had very little formal equestrian education. 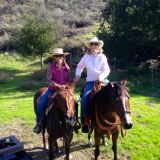 I've had some fabulous horses and some very accomplished friends that have coached me, but basically, I'm a cowgirl. Most of my time in the saddle has been chasing after cattle or scaling tall mountains. At breakfast I had the jitters. What in the world had I got myself in for? My horse's name was "Diu." He's a gorgeous, tall, eleven-year old bay Lucitano, which is the official horse of Portugal. Alexandra, a pretty Hungarian woman who was there interning with Tomaz, placed the little saddle on his back, the bridle on his head, and walked him up the steep hill to the beautiful covered arena. Tomaz smiled at me with a sparkle in his eyes, gave me the thumbs up sign, "Okay?" I put my foot in the little metal stirrup and settled into the soft leather saddle. "Left, please." Pointing to the left. With my heart hammering away, I tried to sit very straight in the saddle, tried to emulate the videos and pictures of dressage riders that I'd watched since making my airplane reservations. "Shoulders… BACK!" he said. "Legs… BACK!" "Relax FEET!" Every time I adjusted one thing, the other parts of my body would fall apart. "Sit… DOWN!" It was harder than patting my head and rubbing my tummy. I walked, then trotted around the arena. "Straight ahead, please." "Circle, please." "Diagonal, please." "Half pass, please." After a few minutes I had to stop just to catch my breath. I wasn't over exerting myself, I was just concentrating so hard that I was forgetting to breath! "Fix your hands…. GALLOP!... PAH!! PAH!!" Diu was every bit a gentleman, riding him was a dream, he was so balanced, so powerful, so elegant. My feet kept slipping the stirrups, but once I got myself in correct position, it was pure ballet. "Slow, slow…." All of a sudden I was Piaffe-ing. I wasn't sure exactly how, but Diu was doing that sort of lifting trot right there in place (Tomaz was cueing him from the ground). This was definitely a gateway drug. After an hour and a half, I almost fell off the horse from shear mental exhaustion. Then I came back after a little drive around the country, for another hour and a half in the afternoon. We did this for three days. Each lesson I could feel myself "get it" a little bit more… "step by step"… Tomaz told me, with a broad smile. I was having a blast! I tried my hardest to listen and tried to do what he told me with a clean slate, to put away everything I'd ever done on horseback for the last 40+ years, but it was like the chalk marks of my past experience kept showing through. By the third day, my body was very sore. My legs, my stomach, my shoulders, my back. Thank God we'd arranged to go to Golega (pronounced golGA) for the Festival of the Horse. This celebration has been going on for hundreds of years (hundreds!). It was still raining. Tomaz and Antonia, along with Alexandra, Jolanda and Victor (a delightful couple from Holland) kept making frowny faces about the bad weather. It rained all the way to the festival, but as soon as we got there, the rain stopped. Golega is a pretty little city, and all through the little cobblestone streets were beautiful men and women on spectacular horses. We walked down to the center of town, where the competition arena lay, tall banners floated in the breeze, huge thunderclouds backlit the scene. Since it had been raining, we were spared the normal crowds, but still, it was extravagantly festive, electric, beautiful. Our eyes wide, we marveled at the horses, the costumes, the smells, and the music. Tomaz was greeted by many friends, embracing and chatting away. Soon we found ourselves in a restaurant at a long table, eating traditional Portuguese food and drinking a fine vino verde wine with about fifteen other people. I looked across the table at David, who was talking to a trainer that lives in Malaga, Spain. He looked over at me and we both smiled. We didn't need to say a word, we both were euphoric. We had two more days of riding lessons, and one evening rode the horses out from the farm, along little dirt roads and cobblestone streets through tiny villages. Tomaz rode up beside me and smiled. Looking down at his horse, and without any notable cues, his horse went into a beautiful passage. Tomaz smiled back at me, his brown eyes bright. It's undeniable how much this man loves his horses and his art. "See there? Sintra!" he pointed to the west, at a magical little city north of Lisbon, the Moorish castle outlined on the high point of the horizon. Saturday night was our last night at Brejo. I asked Antonia if there was a church that we could go to mass on Sunday morning. "Oh YES!" she said, tickled that we wanted to go with them to church. After breakfast, I trotted up to Diu's stall. He was eating away, but when I opened the door and walked in, he turned and looked at me, a look in his eye as if to say, "do we get to ride again today?" Petting his neck, rubbing his withers, I thanked him for being so forgiving with me, for never getting worried as I tried to figure out how to be in correct position with my hands, legs and body. I truly appreciated what he did for me. He dropped his head to my stomach, closing his eyes. "You're welcome" he seemed to say… He is one very special horse, that Diu. We drove a short distance to the tiny church at Santo Estevao das Galas. As we settled into our pew, Tomaz leaned over to me.. "This is where Nuno is buried, in the little cemetery in the back." With my eyes closed, I listened to the congregation singing the familiar songs, reciting the familiar prayers in an unfamiliar language. I felt the music wash over and through me. Like always, in church, I could feel whispers of people now past circle around me, My Mom, my Dad, my ancestors. Then there was Sheila… in church! (that made me smile) and then.. there was Master Nuno, a vague shadow, strong and silent, there in my circle. Oh my, so very nice to meet you Master Nuno.